I’m getting in right under the Thanksgiving wire with a suggestion for those of you who don’t have the full meal already all planned out or need just one more item for your feast. Actually, even if you have the meal planned, I think you should add this because it’s quick, easy, and ridiculously good. Plus, as a bonus, this can easily be converted to be gluten free. Hooray for good GF desserts! Also, you might want vanilla ice cream or whipped cream. Not pictured, but recommended for serving. Butter the inside of a 9×13 inch baking pan. You can also use cooking spray but butter is better. Choose 6-7 nice firm apples like Granny Smith, Honey Crisp, Fuji, Jonathans, etc. 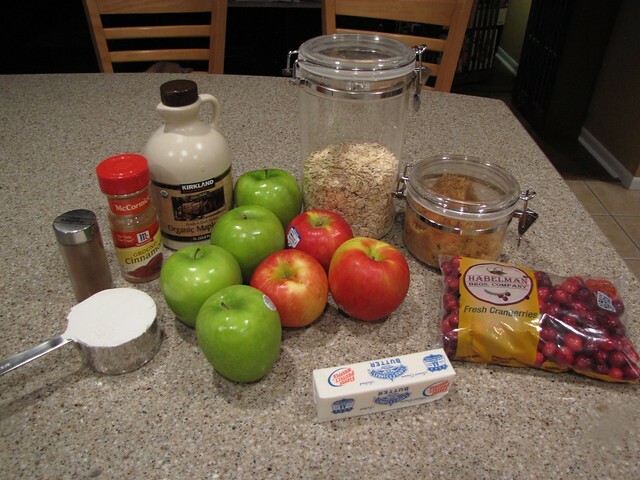 Any good baking apples that you have will do the trick. 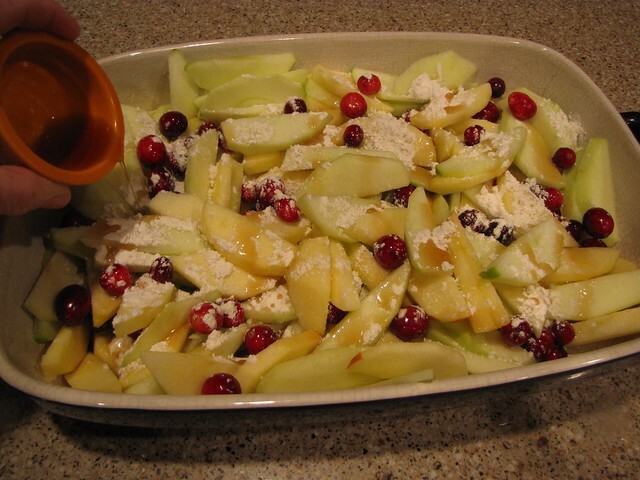 Peel and thinly slice the apples and place them in the buttered dish with ½-¾ cups of whole fresh cranberries. 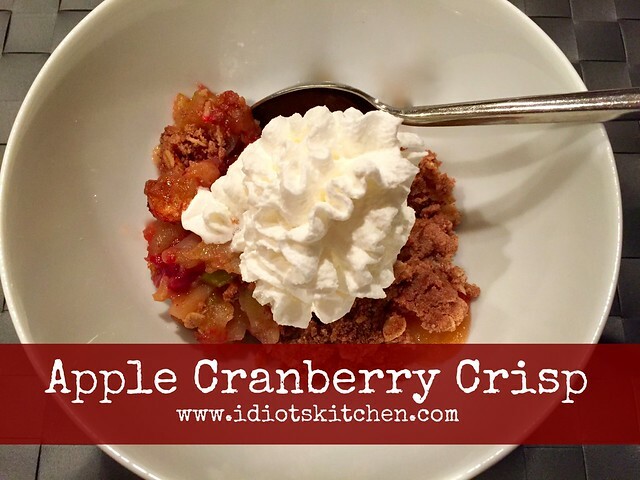 I LOVE cranberries so I used ¾ cup. Sprinkle 1 Tablespoon flour over the fruit (you can use regular all purpose flour or your favorite gluten free flour) and drizzle ¼ cup of real maple syrup over the top. 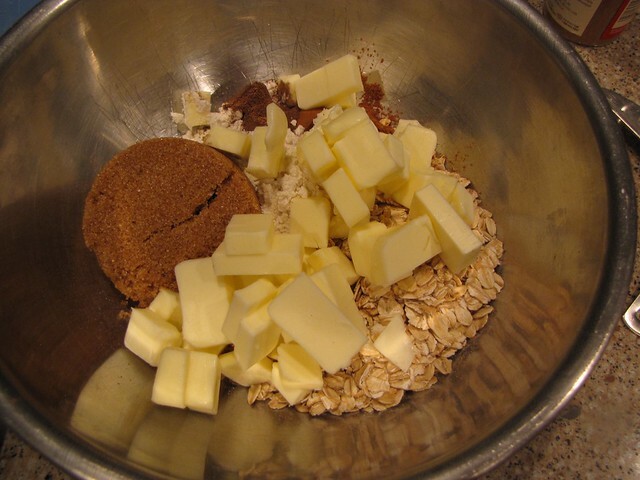 In a medium bowl, combine ½ cup lightly packed brown sugar, ½ cup old fashioned oats (be sure if you’re making this for gluten sensitive people, you check with them and/or use certified GF oats), and ¾ cup flour. Again use regular flour or GF flour. Add 1½ teaspoons cinnamon and ½ teaspoon allspice. If you don’t have allspice you could substitute cloves or a combo or cloves and nutmeg. Or even throw in some pumpkin pie spice if you have it hanging around the spice rack. Cut 1 stick of cold butter into quarters lengthwise and then into small slices. 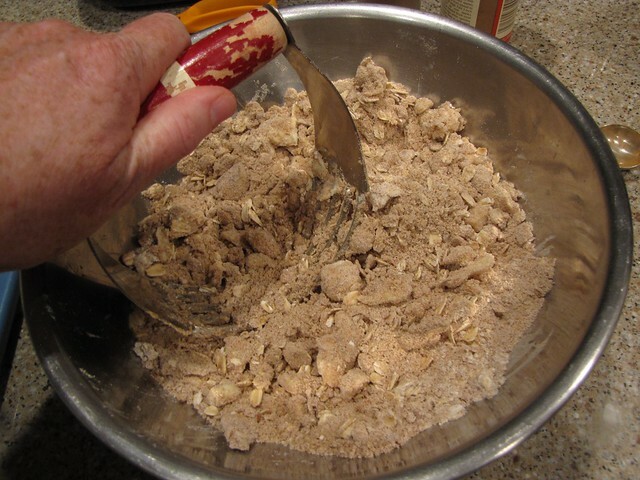 Try to separate the butter pieces as you put them into the bowl of dry ingredients. Use your fingers or a pastry blender to incorporate the dry ingredients into the butter. You want the butter to break down into smaller, pea-sized pieces. 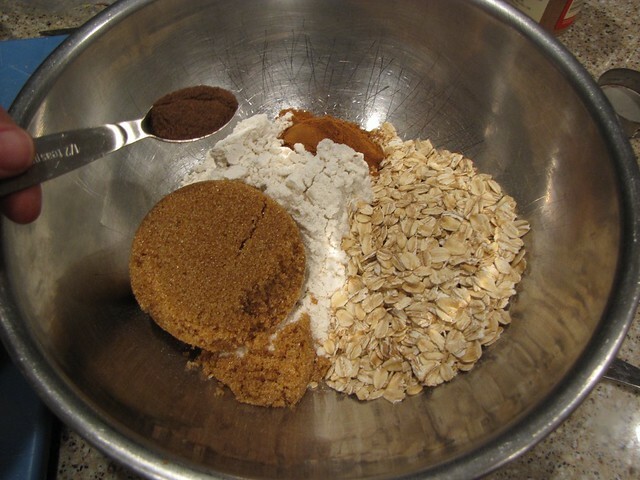 Try not to over work this mixture, you don’t want to break up the oats too much. 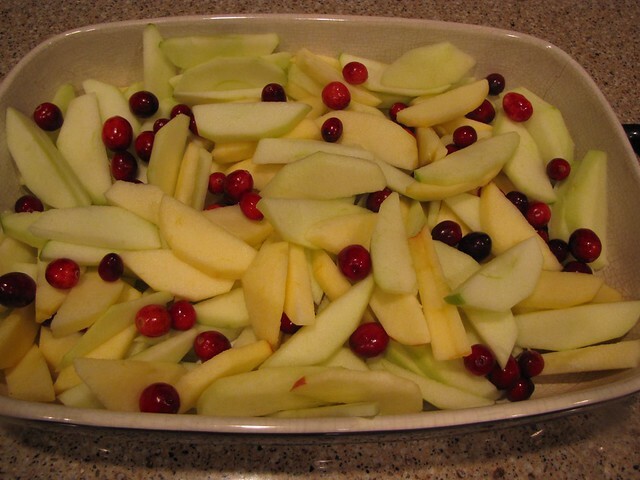 Sprinkle the topping over the apples and cranberries in the dish. Bake at 375° for 45-50 minutes until bubbly and golden brown. Your house now smells awesome! You’re welcome. Serve warm with a scoop of vanilla ice cream or dollop of good whipped cream. Eat it for breakfast the next day too! This is SOOOOOO good! I love that for a crisp, it’s not overloaded with sugar. 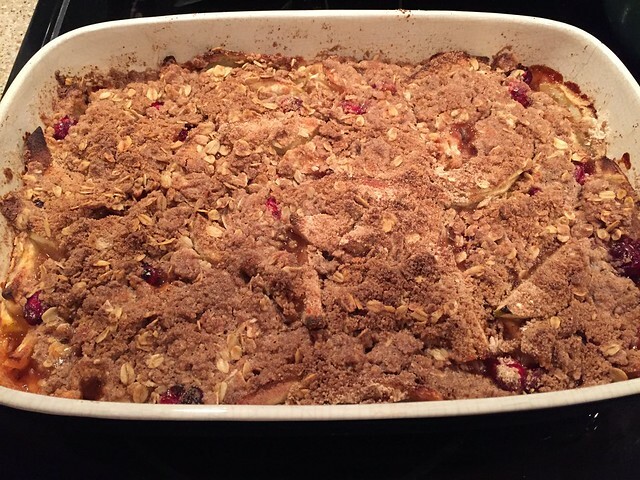 The cranberries give a nice tart zing to the apples and crumbly, buttery topping. This fantastic recipe came to me from our long time neighbor when I was growing up in Kansas City. The Lindholms lived 3 houses down the block from us and had 3 daughters who were just a year or two different in age from my sister and me. We had epic dramatic and musical events in the back yard, Girl Scout festivities and camping trips, Barbies galore, and Trolls before any movie had to tell us they were cool. Years later, thanks to the internet, we are all happily reconnected. One of these days I’m going to crash their family reunion. As Bing Crosby sang, I’ve got plenty to be thankful for! Happy Thanksgiving, friends. 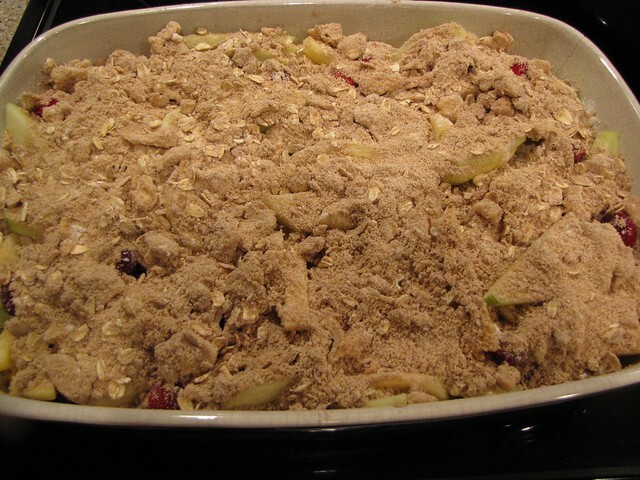 We use to make this all the time, it’s so good!! 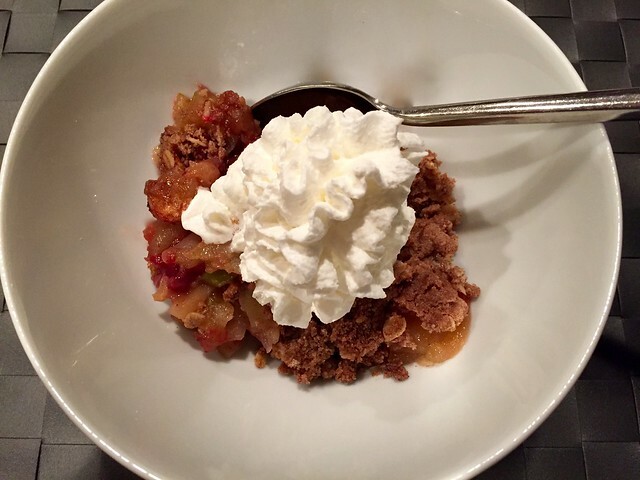 I’m wondering if I can pull off another dessert for Thursday… or Friday… or Wednesday.